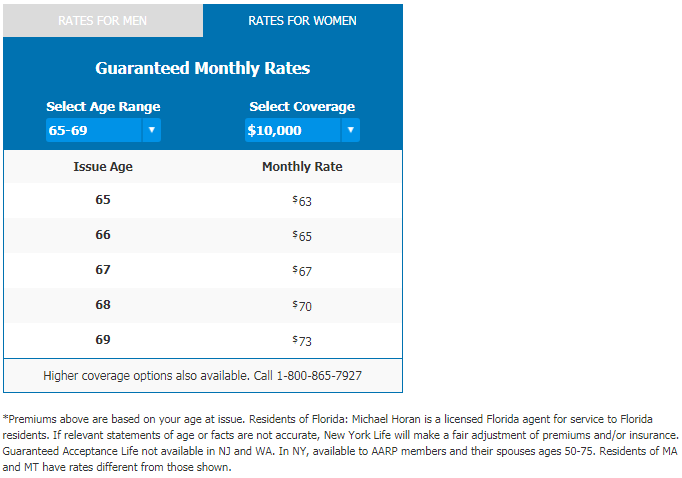 New AARP Life Insurance Review (New York Life Insurance)  | A Must Read! A master marketer, AARP has grown to over 37 million subscribers. The not for profit organization has a large group of people to sell products to, definitely. They do take advantage of it. I have been on the mailing list myself since I turned 50!! Now, you should know that AARP is not an insurance company. They don’t pay claims. The do not underwrite insurance. However, they are a marketing organization that showcases life and health and even auto insurance products. All AARP Life insurance is underwritten by New York Life while health insurance is underwritten by the giant, United Health Care. Oh, yes…automobile insurance coverage is provided by The Hartford. Today’s A A R P life insurance review will be discussing the products New York Life Insurance designed for AARP to sell to its subscribers. Are they anything special? Do they provide good value for the typical senior citizen. Are these some of the best offerings on the market for your dollar? Does the AARP life insurance program have seniors best interest in mind? AARP has a business arrangement with New York Life to provide life insurance to it’s members. 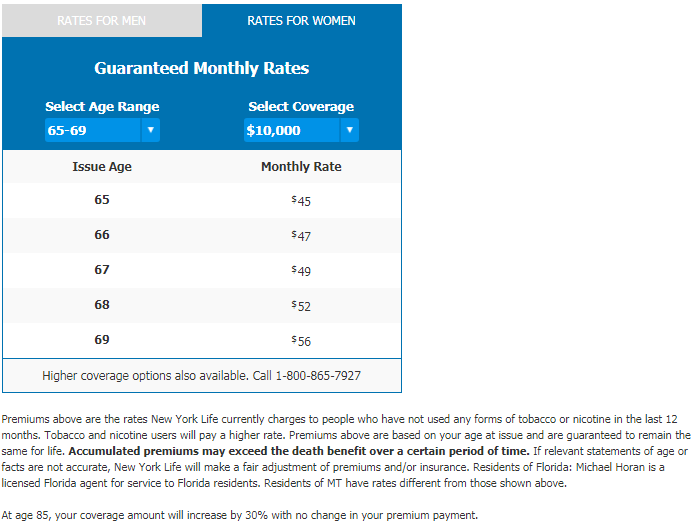 This is a life insurance plan offered by AARP but actually underwritten and administered by New York Life. There are a total of 4 life insurance offerings to choose from. 3 of them are designed for seniors. Yes, AARP is paid handsomely for selling these products by New York Life. You must be a paying member of the organization to have access to the products as well. So, AARP is offering 1 life insurance company to all its members, no more. Should you assume that their offerings are the top notch since they are from an association for retired people? I am going to say, no!! Do you like going to the grocery store and only having 1 choice of everything? Exactly. Choice is important. Choice gives you the opportunity to find what is best for you and at a price you can afford. New York Life offers may fine products, but their premium offerings are found only thru New York Life insurance agents and independent agents/brokers. AARP offers 1 term life insurance product. For review, term life insurance is temporary coverage. You are “renting” protection for a certain time period after which coverage “terminates.” You are paying for pure insurance protection only. There is no cash value or return of any premiums in this policy. 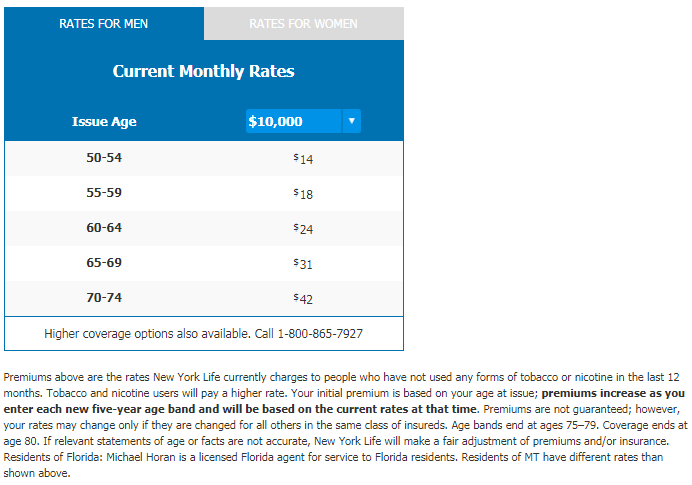 This is the nature of term life insurance and not exclusive in anyway to AARP New York Life coverage. This life insurance product is available with death benefits from $10,000 to $100,000. Higher amounts are available but special approval required. As a simplified issue policy with limited health questions, designed for senior health and ease of qualification. No medical exam is even required. Your answers to some basic health questions will determine eligibility for coverage. Most people who apply are accepted. Now, go down below and take look at the AARP term life quote. Sounds looks pretty great right? Well here is the major problem with this product. It is advertised with the terminology “affordable rate that increases over time.” Your rate are never guaranteed here folks. They can still go out beyond the quoted prices every 5 years. That is the minimum it will rise. Examine the fine print below the snapsnot we included below. Here’s the reality of AARP Level Benefit Term life insurance. This type of policy is rated up every 5 years regardless of your health. In other words, it is not a fixed cost for the life of the policy. This frequently becomes unaffordable in the future and dropped when your health is not as good anymore making it tougher and more expensive to qualify elsewhere. Not displayed clearly is the expiration of coverage at age 80! We all know plenty of friends and relatives that have lived beyond age 80. Yes, you are guaranteed the right to purchase another permanent, whole life insurance policy that is endorsed (sold) by AARP to continue coverage. Problem is…now your older, and they rate your premium based on your current age at your attained age. Big bucks folk. Whole life insurance gets expensive at age 80. I should know because I broker lots of life insurance companies. You will have some hard decisions to make at this point. It is going to be a lot more expensive!! Ladies and Gentleman, I have worked with plenty of very upset people over this type of coverage. Anything other the guaranteed level term life insurance is low grade to start with. Most just did not understand what they had bought from the AARP representative. While the death stays level, the premium is anything but level. Good way to get an upset client. Reputable life insurance agencies refuse to market policies like this. My advice…Term life insurance should be disregarded if you are planning for final expenses/funeral or a burial policy. Never, never, never!! Term life insurance is for a completely different application beyond the scope of this article. This A A R P life insurance product sells because it appears to be cheap. In fact, this product is far from affordable for many seniors long term. The biggest problem is…What happens when you outlive the “term?” It is temporary coverage folks. Now you have your hands tied while AARP and New York Life have been endowed. Ask yourself how you would feel about that before purchasing. Now this is a product designed to better get the job done for today’s senior citizen. People are just simply living longer. Modern medicine has a lot to do with it. AARP Permanent life insurance offers a lifetime of protection and a guaranteed level premium for life. Take a look at the sample rates below. While it may not have your exact age, it gets you an idea and basis of comparison. You can obtain coverage all the way up to $50,000 and still have no medical exam. Full benefits are available upon acceptance. In other words, there is no waiting period for full coverage. Your eligibility for this policy is simply determined by health questions during application. They are designed for seniors. Further, the premium cost will never change. This permanent, whole life policy is another simplified issue policy in which most seniors who apply will be accepted. Higher coverage amounts may be requested, but require additional approval before application can be made. This AARP New York Life policy will accrue cash value, but will be limited in that regard. We do not recommend the use of the the cash value in these policies as it will decrease the payout to the beneficiary upon your death if the cash value is not repaid back into the policy. This is better product for seniors without a doubt. You will know exactly what you will be paying per month for the protection. The cost will never change regardless of your health and you cannot outlive the benefits. My evaluation…good coverage for a senior who is looking for burial insurance, final expense coverage or the like. Very easy to apply for, but quite expensive compared to the other top life insurance carriers on the market. There are much better values out there for your money. All the AARP life insurance policies reviewed today are no medical exam. This makes acquiring life insurance for a significantly easier to obtain. No needles and no one visiting you at your home to check your health. The downside is that coverage will cost a bit more without the exam in place. The company cannot verify you current state of health without a paramedical exam. As such, they raise premiums to offset the additional risk to the insurance company. This type of product is not revolutionary and is quite common in the industry. 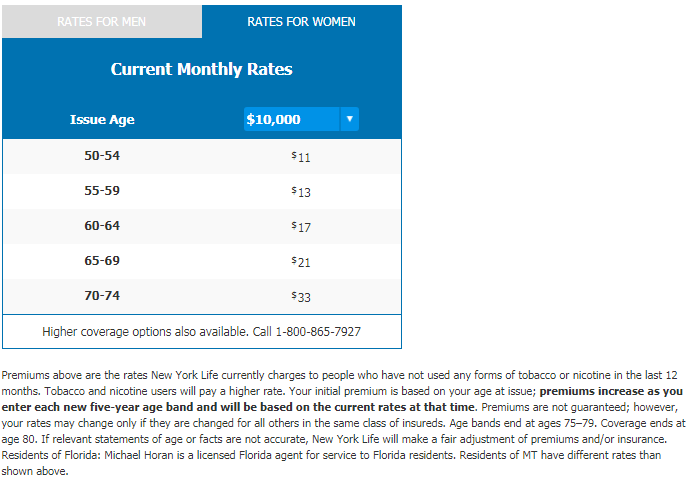 Ok, here is where life insurance can get a bit pricey for a good number of seniors. While this product is a permanent, whole life insurance product, it has some limitations you should be very aware of before even considering the product. You must be clear that this offering accepts anyone regardless of health. Look below for the rates on the guaranteed acceptance product. For some, that is a saving grace. If you have a terminal condition, this is all you probably qualify for. This guaranteed issue policy is a permanent, whole life insurance policy which means you cannot outlive the benefits. Your premiums can never go up nor will the death benefit go down unless any cash value is borrowed and not repaid. Again, predictable and good for seniors on a fixed income. Incidentally, very typical of a burial/final expense policy like this. Guaranteed Acceptance means just that…no health questions and no medical exam required to qualify. Problem is, most people will qualify for lower rates elsewhere and have none of the limitations of this expensive, AARP offering. Here is a key point to remember. This policy will not cover any insured for natural death the first 2 years. It has what is called “limited” benefits the first 2 years. During this 2 waiting period, if death occurs to the insured, the beneficiary would receive a refund of paid premiums plus compounded interest. Problem is, that doesn’t get the job done very well does it? It is easy to qualify for, but how does that help your loved ones handle the financial stress brought on by death? This policy is also capped at a maximum death benefit of $25,000. After the 2 year limited waiting period expires or if accidental death occurs, full benefits of the purchased policy will be available. Take the time to use our quoting tool in the right sidebar. It will take you a minute or so, but you will see how overpriced these AARP policies are. Folks, there are many companies that just have better products and rates. You will be able to see all the different company offerings right away and have access to the top life insurance offerings. You probably sensed my bias against the Guaranteed Acceptance Life Insurance. Honestly, I don’t care for the product in vast majority of cases we as a company run across. Seniors are not clearly explained the limitations nor how much extra they are paying for this policy. Having no medical questions in a application raises the rates way up!! Sounds great when you don’t know the facts and have not heard about all the other options. So, not only are you paying thru the nose for coverage, you don’t even have full coverage for 2 years!! If you have a terminal condition and need Guaranteed Acceptance life insurance, Gerber Life or AIG usually have the best rates. Go here to get more information. I further dislike the AARP life insurance term policy. Simply put…this specific product is not for seniors at all. As a company, we hear nothing but angry or disappointed people who drop the coverage after they have had it a few years. It goes up every five years and expires at age 80. Many seniors drop it when the need it the most. Avoid this product!! You were warned here. AARP’s best offering is their permanent, whole life product which is just a simplified issue life insurance policy with limited health questions. It offers full benefits right away. Most people will qualify…regardless of being in their “golden years.” Keep in mind, this type of product is senior oriented and forgiving of common health issues. Get more information about how to save money on no exam, senior life insurance and avoid paying for policies that are not in your best interest. Am I saying you should go cancel your AARP New York life insurance policy? No, but I would be looking at the better offers on the market especially if you have the “level benefit term” offering. Sorry to say, these are overpriced policies that do not deliver real value. Wrapping up, I cannot give a thumbs up to any of these products. If this is not an opportunistic product benefiting AARP versus the senior citizen member, then it is simply not competitive price or benefit wise either. These AARP offering are not superior burial insurance products driving good value to a policyholder. New York Life Insurance tends to have some higher rates than other life insurance companies, but those products are value driven and offer a bit more for the premium paid. 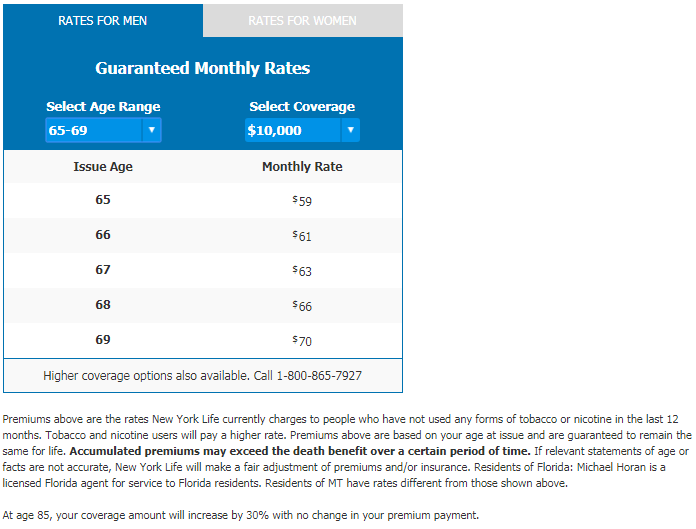 NYL premium products are not available thru AARP either. As you comb thru other AARP life insurance reviews, remember that AARP makes good money off the sale of these policies. It is mind boggling how much. This is at your expense and you are not receiving a premium policy in exchange. According to Forbes, in 2012, AARP supported Obamacare’s cuts to Medicare benefits. AARP managed to make 2.8 billion thru doing so. Be advised, AARP has some very, very high paid people running the “not for profit” company it claims to be. The product offerings provided to its members are proprietary products marketed only by AARP and its sales force. The A A R P life insurance program does work with NYL to provide coverage. 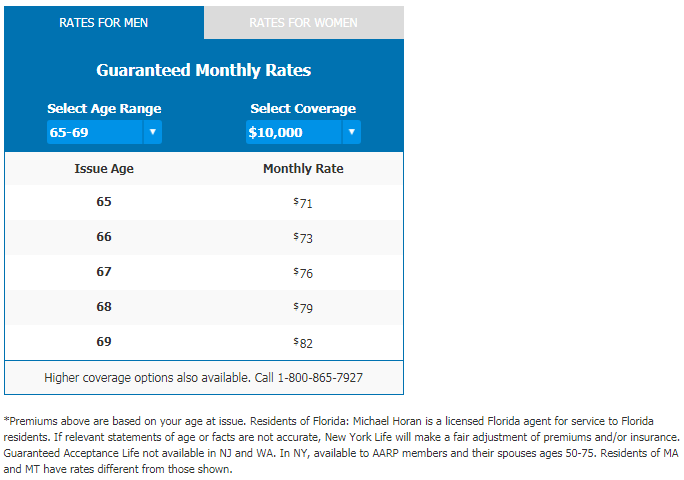 However, New York Life offers its best, premium products outside AARP thru its captive and independent agent network. New York Life does offer some excellent products, but the offerings reviewed here are not in the same class. Be careful what you are buying. Life insurance is not apples to apples like many assume. We all want to buy the right coverage don’t we? Carefully consider what you are purchasing before assuming it must be a good product for you since AARP endorsed it. It means nothing folks. Is A A R P your friend in your life insurance quest? In the meager opinion of this independent life insurance agent, no. Get yourself a good independent agent/broker. You will do a lot better and have all your options in front of you instead of 3 disappointing, overpriced products from 1 company.